Rust manages to make systems programming easier, safer and faster. From basic programming patterns to a peek under the hood of the language, this book aims to help you move from writing programs to building software in Rust. 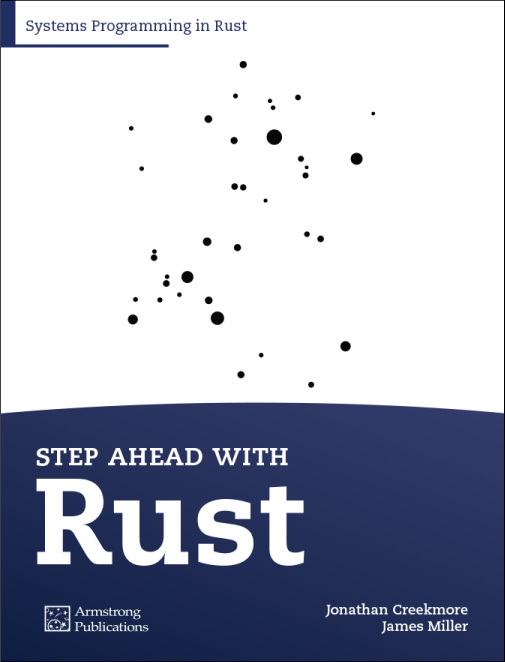 Step Ahead with Rust will show you the most important features of the Rust language, including Cargo, Type System, Iterators and more. By the end of this book, you should be familiar with far more of them, and ready to tackle the rest of advanced topics. The writing is very well done as it tries to explain intermediate/advanced Rust concepts by-example and by showing real-world use cases. This is a welcome change from entry-level tutorials/books that just cover Rust’s syntax without showing potential useful applications of it. The writing is interesting, clear, and moves quickly, making it a very enjoyable read. It also pleasantly avoids the common issue that textbooks have of talking down to the reader. In addition, it covers material at just the right speed, which really works nicely with the subject matter. The graphics are extremely helpful and I like the chapter length and material. James Miller is a developer involved with the Rust project for over two years and seen a lot of its evolution (and have had a hand in some of it). Most of his involvement has been in improving the compiler output, but he tinkered with most parts at one point or another. James spends a lot of time on the Rust IRC channel helping new users. He has acquired a lot of experience guiding people through the language. Jonathan Creekmore has been an embedded systems and security software engineer for the last 16 years. In days past, Jonathan has worked on custom RTOS kernels and device drivers for routers, switches, and IoT sensor nodes, as well as on a software protection product built around the Linux kernel. For the last two years, Jonathan has been working with the Xen hypervisor and writing security software utilities in Rust, his new favorite programming language. Currently, Jonathan is one of the principle software engineers developing Crucible — a secure, authenticated, boot solution for embedded virtualization. Rust is a systems programming language focused on three main goals: safety, speed, and concurrency. This makes Rust usable in areas where few languages dare to tread: embedded systems, device drivers, and operating system development, to name a few. Rust doesn’t skimp on the higher-level features though – with a sophisticated type system and a number of modern conveniences, Rust manages to make systems programming easier, safer and faster. From basic programming patterns to a peek under the hood of the language, this book aims to help you move from writing programs to building software in Rust. Step Ahead with Rust will show you the most important features of the Rust language, including Cargo, Type System, Iterators and more. By the end of this book, you should be familiar with far more of them, and ready to tackle the rest of advanced topics. As you progress through the book, we recommend taking the time to experiment with what is presented in its pages. This book is all about the practical application of Rust, so applying it in practice is expected. A Step Ahead with Rust reader is expected to be a moderately experienced developer looking to improve their Rust development skills.